The Frame docks have a solid 5.5" aluminum frame which bolts together. Each 10' section comes with 2-5' leg assemblies, and connectors to join on another section. One section supports the next section (a minimum of two sections required to start, or additional leg assemblies are needed). Wood for decking not included. Leg height is adjustable, using set screws which tighten against the leg. 16' long x 6' wide Modular Truss Dock. 2-8' Modular End Modules which connect with couplers. Comes with 2-4' leg assemblies and 2-8' leg assemblies, and all necessary hardware. Decking not included. This 24 ft. L x 6 ft. W Modular Truss Dock comes with two 8 ft. end modules, and one 8 ft. expansion module which connect with couplers. It also includes two 4 ft. leg assemblies and two 8 ft. leg assemblies, as well as all necessary hardware. Decking not included. 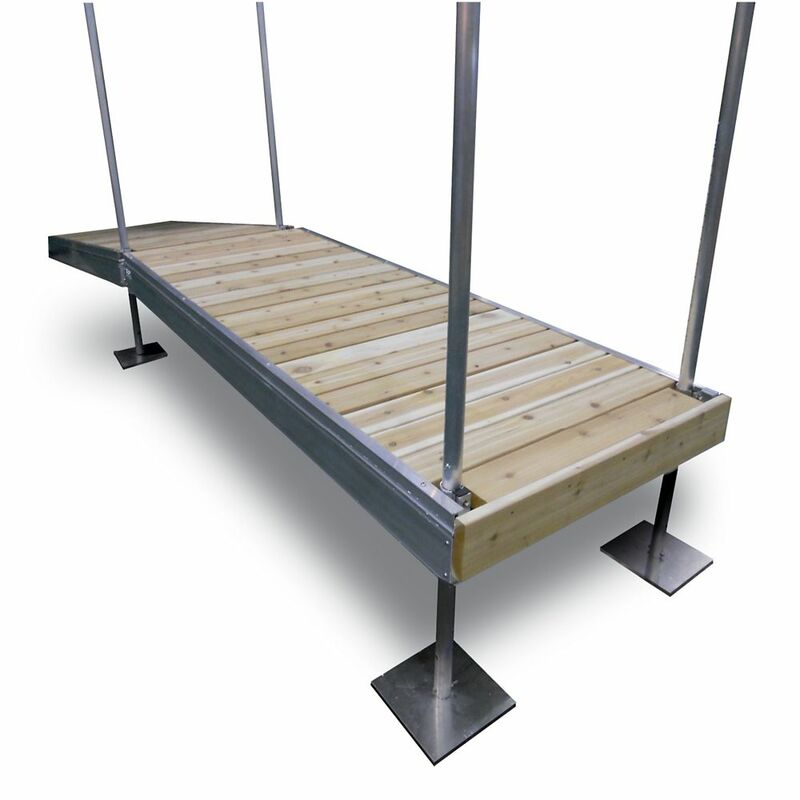 This Modular Truss Dock is made from lightweight, sturdy aluminum with all stainless steel hardware. It's easy to assemble and comes with two 8 ft. end modules and three 8 ft. expansion modules which connect with couplers. Also included are two 4 ft. leg assemblies, and four 8 ft. leg assemblies, as well as all necessary hardware. Decking not included. 8' Long x 12' Wide Deck gives you more room to enjoy yourself. Decking not included in price. 10Feet x 6Feet Frame Dock The Frame docks have a solid 5.5" aluminum frame which bolts together. Each 10' section comes with 2-5' leg assemblies, and connectors to join on another section. One section supports the next section (a minimum of two sections required to start, or additional leg assemblies are needed).